Therapy that effects change must authentically involve you, the therapist. 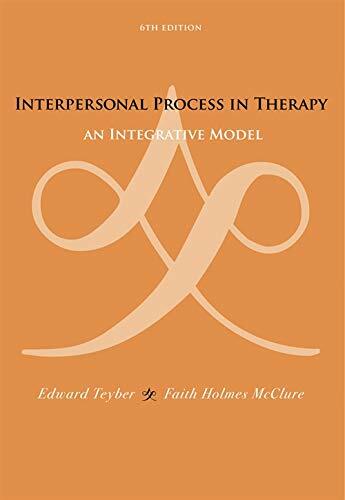 Highly engaging and readable, INTERPERSONAL PROCESS IN THERAPY: AN INTEGRATIVE MODEL brings together cognitive-behavioral, family systems, and psychodynamic theories into one cohesive framework, all the while showing you practical ways to alleviate your concerns about making a "mistake." Newly revised and edited, this contemporary text features new case examples, updated references and research, clinical vignettes, and sample therapist-client dialogues, helping to bring you "in the room" with the therapist, and illustrating the interpersonal process in a clinically authentic and compelling way. This book enables you to be who you need to be in a therapeutic situation: yourself. Both scholarly and easy to use, this counseling text will be a resource you'll use again and again.